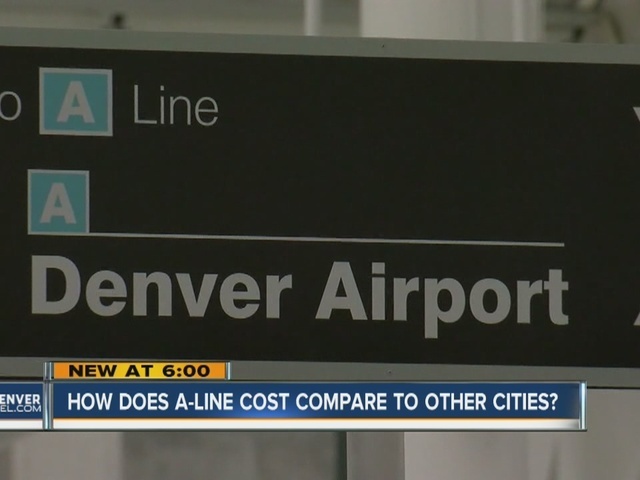 The new train service to Denver International Airport is costlier than rail-to-airport fares in other cities. The commuter rail trip to DIA, which debuted with great fanfare on Friday, costs $9 for a day pass , which allows people unlimited, all-day travel to the airport and across RTD's regional light rail and bus system. "For just the average person it's pretty expensive," said Wanda Wofford, who rode the train to DIA to have lunch with her daughter today. "For a business traveler, I think it's wonderful." There's a $4.50 discounted day pass for seniors, disabled individuals, Medicare recipients, and students ages 6 to19. Active duty members of the U.S. military ride for free on all RTD services. Airport service is included in the EcoPass (provided by employers) and the CollegePass (provided by universities). $2.50 from anywhere on their rail system, includes transfers. $1.70 one-way from anywhere on their light rail system. $5.00 from O’Hare to downtown. When asked why Denver's airport train costs $9.00, RTD spokesman Nate Currey said that's what the bus fare has been to the airport. He said it's part of their cost structure. Currey said Denver's system is spread out over a large area. "Denver's is 2300 square miles," he said. "LA's is 1400 square miles. We have a quarter of their population, so we have to make up the revenue to operate our system." Currey said the $9.00 fare provides much more than a one-way trip to the airport. Another city's transit system may have a cheaper one-way fare to the airport, he said, "but their fares don't include what ours do, like a regional day pass," he said. "So, included in that fare [to DIA], people can get anywhere in the entire RTD system -- bus or rail -- for the day. So there are advantages built into our fare structure that are unique to the Denver region that we're really confident about and feel good about." About 40 members of community and labor groups protested at the opening ceremony for the new rail service from Union Station to the airport. They said all RTD fares are too high and there's a lack of discount programs for low-income riders. "RTD is not prioritizing transit-dependent riders," said DreChiriboga-Flor, an organizer for 9to5 Transit, which advocates for working women and their families. "They have invested $17 million in Union Station and are in the process of allocating $30 million to rebuild Civic Center Station. Clearly this is not a lack-of-funding issue, it’s about prioritizing the people who need public transit the most and who are paying the highest percentage of their income towards it." Last year, Currey said, RTD increased its fare-subsidy program for low-income passengers from $6 million to $7 million annually. RTD distributes that money to more than 200 nonprofit groups around the region who provide reduced passes to economically disadvantaged people. Several passengers waiting to board the A-Line train at Union Station told Denver7 they think the fare is fair. "In New Jersey, I pay $6.50 for a one-way, 30 minute ride from where I live to Penn Station in mid-town," said Lisa Ilaria. "That's not even to the airport. "So forget JFK, La Guardia or Newark, $9.00 for me isn't too bad."